WHAT: Nickelodeon gives New York Comic Con attendees an exclusive look at the hit animated series Teenage Mutant Ninja Turtles, which debuts its epic third season Friday, Oct. 3, and fan-favorite The Legend of Korra, which will premiere Book 4 on Nick.com and the Nick App the same day. During each hour-long panel, voice cast and executive producers will show special sneak peeks, screen a brand-new episode and reveal never-before-seen art. Upon entering the convention center, fans will be greeted by Nickelodeon’s booth, which is inspired by the creativity and imagination streaming from the Nickelodeon Animation Studio. The booth features a bold collage showcasing beloved hits like The Ren & Stimpy Show, The Fairly OddParents, Angry Beavers, SpongeBob SquarePants, Teenage Mutant Turtles, Sanjay and Craig and Breadwinners, among others. Nickelodeon’s booth will also feature raffles and a voice-record room where participants can lend their own vocal talents to select scenes from their favorite Nick TV shows. WHO: Nickelodeon’s Teenage Mutant Ninja Turtles celebrity voice cast – Seth Green (Robot Chicken) as Leonardo, Rob Paulsen (Planet Sheen) as Donatello and Greg Cipes (Teen Titans) as Michelangelo along with executive producers Ciro Nieli and Brandon Auman. The Legend of Korra celebrity voice cast – Janet Varney (Dinner and a Movie) as Korra, David Faustino (Married with Children) as Mako and PJ Byrne (The Wolf of Wall Street) as Bolin, along with co-creator and executive producers Bryan Konietzko and Michael DiMartino. The TMNT costumed characters, Leonardo, Raphael, Donatello and Michelangelo, along with SpongeBob SquarePants and Patrick, will be available for photos throughout the day Thursday-Saturday at the Nick booth. WHEN/ The Legend of Korra panel Thursday, Oct. 9 5:15p.m.-6:15p.m. The Legend of Korra signing Friday, Oct. 10 11:00a.m.-12:00p.m. Teenage Mutant Ninja Turtles panel Friday, Oct. 10 2:00p.m.-3:00p.m. 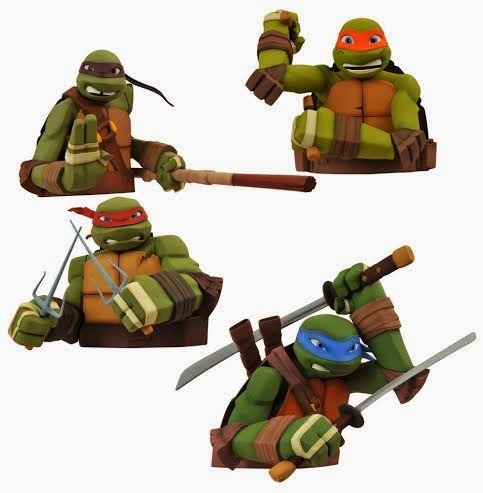 Teenage Mutant Ninja Turtles signing Friday, Oct. 10 4:00p.m.-5:00p.m.